50% of all proceeds from this and all of my patterns will be donated to Doctors without Borders for disaster relief during March. 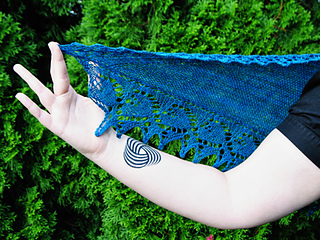 Step up your small shawl game! 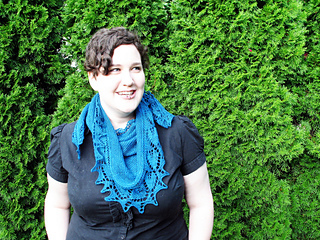 Inspired by a beloved childhood film, this shawl is the perfect companion, both for knitting and wearing. 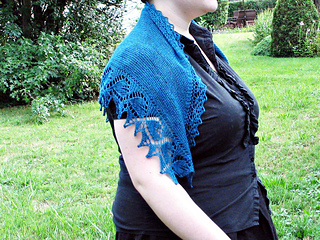 A complex leaf lace motif at the hem gives way to a simple, delicate top border and soothing garter stitch, while an unusual edging-first construction provides entertainment even for more advanced knitters. 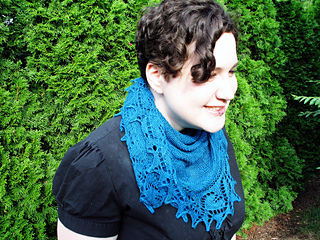 The laceweight yarn and small needles give the fabric a fantastic squishy feel, great for draping over short sleeved shirts on breezy late summer evenings, but also wonderful for scrunching around your neck as the chill of fall and winter moves in. 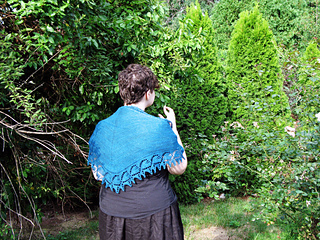 Shaping in the lower body of the shawl rounds out the bottom edge, and creates a wedge that might just become the keyhole to your very own secret garden. 7 page PDF, with both charted and written instructions as well as a small tutorial for the sideways cast-on technique used in pattern.